The WordPress Toolkit simplifies daily tasks required to manage and secure WordPress sites. Give your customer back hours per day so they can focus on their core business. The WordPress Toolkit is included in both the Parallels Plesk Web Pro and Web Host The WordPress Toolkit simplifies daily tasks required to manage and secure WordPress sites. Give your customer back hours per day so they can focus on their core business. The WordPress Toolkit is included in both the Parallels Plesk Web Pro and Web Host editions. Manage multiple WordPress installations, plugins, themes, updates, and upgrades from a single point of entry. 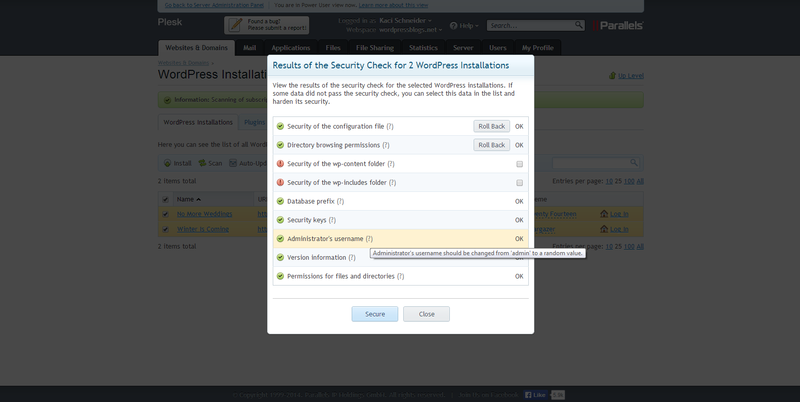 Scan WordPress installations to identify insecure settings and secure them in one click.